I just received my copy of "Beneath the Ruins", written by Alex Fotinakes, and published by Geof McKinney. It comes in a totally practical format, which I absolutely love. The tall booklet orientation works really well -- it feels great to hold and read. It really has a gorgeously usable feel to it. The page count is also delightfully low, which is a major plus point in my mind. I can never be bothered to read and comprehend longer than about 30 pages for an adventure, so Beneath the Ruins really hits the mark. Apart from the maps inside the cover, the module is completely free of artwork. Of course, I love cool artwork as much as anyone, but the decision to go art-free was a shrewd one, and works great. It serves, in my mind, to increase the pragmatic feel of the module, and to maximise the content within the small number of pages. "These are not works of art. They are utilitarian modules meant to be inflicted upon your players." "Every monster, every magic power, and every magic spell is a unique and never-before-seen creation of the author. No orcs, fireballs, or +1 swords will be found within." That's part of Geof's description / mission statement for his Psychedelic Fantasies line of modules, of which this is the first. A very cool sentiment indeed, and one which I find myself moving more and more towards in my own creations. With this in mind, though, one thing I couldn't help noticing was that some (well at least one) of the totally unique creations do verge on being simply renamed standards. 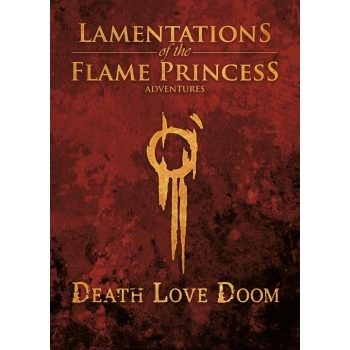 I suppose this is extremely difficult to avoid, in the genre of D&D adventures where so much has already been done. The specific example from Beneath the Ruins which I'm thinking of is the room guarded by "cursed corpses". Yes, you can guess what those are. I suppose perhaps the intention is that the act of giving them a different name increases the likelihood of the referee improvising unique details about them, rather than just saying "6 zombies" directly to the players. In terms of the content of the module, it's top notch dungeon weirdness. The room descriptions are short enough to be eminently readable, while really packing in interesting details. Before buying this module, I was totally convinced by the simple, pragmatic format but high weirdness marketing on the Psychedelic Fantasies blog, and now I've actually got the thing in my hands I'm even more convinced. An awesome D&D accessory, and one which I can't wait to use. I've already got it placed in a map for my upcoming Dreamlands campaign. Continuing on from the rules of reality in the Dreamlands, here's how the game sessions themselves will be structured. As you can see, I'm going for a kind of episodic West Marches feel, where a large pool of players can participate in a single campaign, with different PCs joining forces each session to form an adventuring party and continue their explorations. 1. Each session begins with the PCs drinking the Sardo brew and entering the Dreamlands. 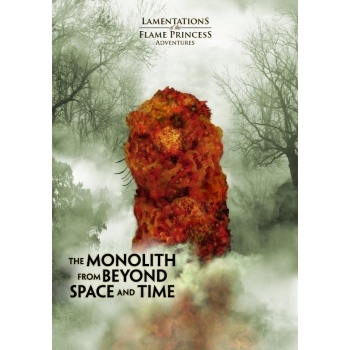 The name of a monolith may be spoken at this point, if desired. It is the players' responsibility to remember the names of any monoliths they encounter. 2. The referee shall set an alarm clock, determining the end time of the session semi-randomly. A reasonable time should be set, but with enough variance that the players can't predict when the session will stop. When the alarm goes off, that's it -- the PCs awake immediately, bringing with them any treasure on their persons. 3. Any "in town" stuff (planning, buying equipment, learning spells, etc) shall be conducted between sessions, either by each player on his or her own (using appropriate equipment lists and so on), or in consultation with the referee and/or other players via email or whatever. 4. All characters spend 10% of their total wealth between sessions (to be deducted at the end of a session, after XP has been allocated). This covers their (presumably fairly extravagant) living expenses, equipment maintenance, religious offerings, random taxation, and so on. Players in my games -- Nothing to see here, move along! In the planning of my upcoming Dreamlands campaign, I'm intending each level of dream to be a wilderness area scattered with many interesting encounters and/or dungeons. The idea being that PCs can choose to dip into any of the dungeons they come across, exploring more deeply in any which take their fancy. So, what I need is a lot of small dungeons, and a few larger ones. The larger ones I'm quite happy to take from published sources (Fight On!, for instance), and there are plenty of one page dungeons around which I could slot in as well. But of course, I want to create some small dungeons of my own to give the flavour I'm looking for. With this in mind, I've conceived a new way of writing adventures -- speed dungeons! The concept is to map and fully key a dungeon (or as far as possible) in an hour or less. So, a single sheet of paper, with a quickly drawn map and loads of scrawled notes all over it. For the interest of other DMs, I present the first fruits of this experiment -- The Caverns of the Silver Men -- a mini-dungeon which I created last night in about 50 minutes. I'm not sure if it'll be particularly comprehensible to anyone else, or if you'll be able to decipher my hand-writing, but please check it out if you're interested! 1. Living mortals may enter the Dreamlands via the city of Darhoo, by imbibing the intoxicating brew of the sap of the Sardo tree. The secrets of this tree, its sap, and the brew which can be fermented from it have been known in Darhoo since ancient times. Only Darhoo, on the edge of the Styrgian desert, lies close enough to the dreamlands to enable transit between worlds, and only then on the night of the crossing moons. 2. The Sardo brew transports a mortal, along with their possessions, into the upper level of the Dreamlands, which is known as "the phantasmagoric glades". 3. Nine deeper levels of dream are known to exist, each with their own name and character. The deeper levels of dream are said to be more perilous to mortals, but also riper with wonder and bounty. Gateways from one level of dream to another may be found within the Dreamlands. 4. The effects of the transportative Sardo elixir do not last forever. In Darhoo-time, dreaming travellers return to the desert city after some few hours in the other realm. In Dreamlands-time the duration of the effects is variable. Dreamers have reported weeks of travel during a single jaunt. Others report mere minutes before returning to the waking world. 5. The duration of a jaunt into the somnambulistic sub-reality can in no manner be controlled. The whims of the Dreamlands are at play here, and dreamers may find themselves awakening at the most inopportune moments. 6. The Dreamlands may be disjointed, shifting and phantasmal, when compared to the waking world, but they are in fact every bit as real. Treasures found in the Dreamlands will return with a dreamer when his or her time is over. Equally, death in the Dreamlands is true death. 7. Dreamers report that a series of monoliths exist throughout the Dreamlands, each of a similar type, and inscribed with a name. Speaking the name of a monolith one has seen in dream, while drinking the Sardo juice, effects a return to that spot. A dreamer's companions may also be taken along in this manner. Clockwork dwarves, and psychedelic gnomes, reptiloids, gullygugs and rat-men! Gather ye souls of wandering persuasion and prepare to enter the shifting sub-reality of the Dreamlands. 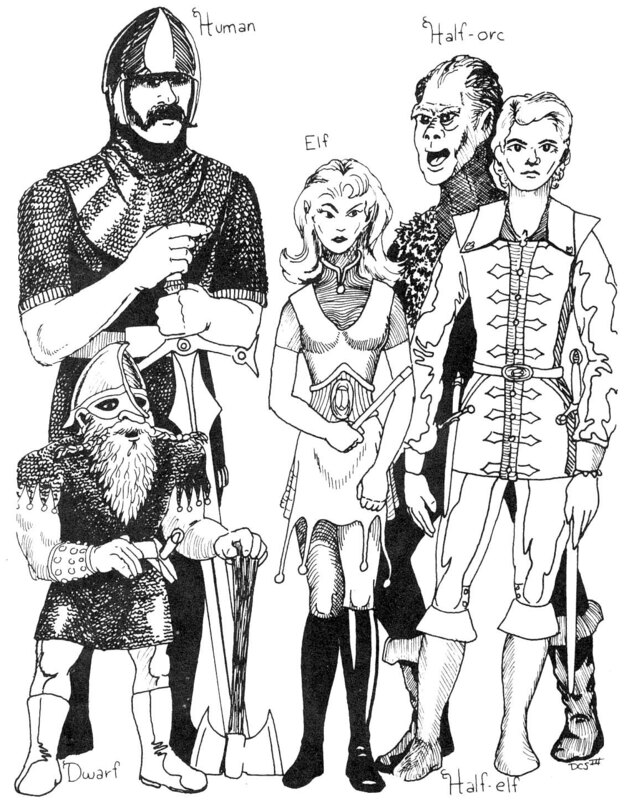 Note that the clockwork dwarf race is obviously inspired by Hill Canton's robo-dwarf class. The rest of this post is designated Open Gaming Content according to the Open Gaming License. Clockwork dwarf: These rare beings of obscure origin are occasionally encountered in adventuring parties or working as clock-smiths. They have all the normal faculties of a sentient being, but are made of metal (typically brass or bronze) and run on clockwork. Clockwork dwarves cannot ingest normal food or water, and indeed react to such as poison. Instead they must consume one pint of lamp oil every other day, and often like to snack on nuts and bolts. Additionally clockwork dwarves have the substantial advantage over their fleshy brethren that they do not need to breathe, and can thus happily exist in airless environments. It must however be noted that clockwork dwarves are damaged by water, taking 1d3hp damage per round they are submerged. This can be avoided by pre-preparing themselves by smearing 3 pints of oil over their whole body. Such protection lasts for several hours. Clockwork dwarves have no affinity with stone, and lack all of the standard dwarfish stonework abilities. They do however have a natural armour class of 7. Strangely, healing magic (including potions) works normally on clockwork dwarves. The reason for this is a mystery. Stone dwarf: Some dwarven communities have retreated so deep into the mountains that they have, over many millennia, begun to meld with their stony environment, becoming beings half-flesh, half-stone. Such dwarves are as slow and determined as rock, and gain several advantages. Firstly they have a natural armour class of 5. Secondly they are completely immune to petrification magic, being already half-stone. They also have the ability to speak the language of earth elementals and their kin. As a downside, healing magic of all kinds has only a 50% chance of taking effect on a stone dwarf. Deep gnome (a.k.a. svirfneblin): This race dwells in deep subterranean caverns, and are sometimes encountered by dwarves as they delve for metals. Deep gnomes are an especially miserly race, giving them a -2 CHA penalty. On the positive side, they are able to identify gems and precious metals simply by smell, and at a distance of 10'. Forest gnome: A meek and homely race, unlikely to produce much in the way of bold adventurers. They dwell in shallow burrows in sandy forest soils, and do not have the deep affinity with the subterranean world which their cousins possess – they are unable to detect their depth and orientation underground. They do however have ability to speak the languages of burrowing animals, which are often found in their company. Psychedelic gnome: The origin of the psychedelic gnomes is something of a mystery, and the gnomes themselves refuse to provide details. Physically they are very similar to their “bog-standard” counterparts, however their behaviour and tastes are wildly different. Psychedelic gnomes, as their name implies, have an outrageous style of dress, eschewing the traditional drab earth-tones and red pointy hats in favour of clashing fluorescent colours, swirling paisley, tie-dye, and apparently religiously inspired patterns which they refer to as “fracktals”. Some sages suspect that these gnomes are from the future. Psychedelic gnomes have no affinity with earth or stone, and lack the standard stonework abilities of their race. They are also of a less robust constitution, and gain no bonuses to saves against poison, paralysis or petrification. Instead they have an affinity with magic and illusion, which grants them alternative abilities. Firstly, all psychedelic gnomes know how to cast a single 1st level spell once per day, chosen at random from the illusionist spell list. This spell is innate, and does not require study or a spell book. Additionally their affinity with magic of illusion grants them a +4 bonus to saving throws versus this type of magic. On a successful save, there is a 15% chance that an illusion spell will rebound from a psychedelic gnome and affect its caster. Half-bugbear: Hairy beast-men whose racial heritage is plain to see. Half-bugbears lack the standard half-orc's ability to find secret doors, but are instead able to move silently as a thief of equal level. Half-bugbear thieves instead gain a +10% bonus to their move silently skill. Neanderthal: This race of brutish sub-humans are sometimes known to leave their caves and mix with other races. They have no ability at finding secret doors, but have a natural resistance to magic, gaining +2 on saving throws. James Raggi's latest. Very much looking forward to reading and running them. In fact a future campaign I'm currently contemplating sounds like it'll be the perfect setting for the Monolith. It's an old conundrum of AD&D: the balance of humans vs demi-humans. If you look at a mixture of 1st level characters of various race/class combinations, the demi-humans are clearly way more powerful with their infravision, huge saving throw bonuses, and the ability to potentially have the complete abilities of up to three classes. All these things give them an enormous advantage compared to their full-human brethren. In a dangerous old-school campaign, 1st level demi-humans are way more likely to make it to 2nd level -- that's the fact. And what do humans get as a balance? No level limits. So that's the traditional state of play. Now, in my experience this is not a balanced situation, not at all. The problem lies in the fact that no campaign I've ever played or run has reached the levels of experience where demi-human level limits kick in. And I think this is a common experience. (This is with the exception perhaps of long campaigns when I was a kid, but then we were playing BECMI, not AD&D, so it an wasn't issue.) Thus, players of demi-humans basically get all this cool stuff "for free" as it were, leaving their human comrades feeling a little under-par. I have to say at this juncture that I don't care about balance purely for its own sake, in mechanical terms (for therein lies the road to 4e). The only reason I'm drawn to consider this is my observations of how players of "lesser races" (i.e. humans) feel overwhelmed by their "do anything, +4 on saves, see in the dark, oh and by the way I speak 7 languages" counterparts. A novel remedy to the situation came to my mind the other day, which I shall describe. No level limits for demi-humans. Gone. They're rarely relevant anyway, and do nothing to create a sense of balance. Limits of class by race could also optionally be removed, if you want to go all the way. Firstly multi-classing. As I've discussed before, that's the real killer for me, resulting in characters who can "do anything" -- honestly, who needs a thief when you have a multi-classed magic-user / thief at hand? As a second reduction in demi-human power I'd suggest the removal of infravision from all playable races. It seems like only a minor perk on the face of it, but in practice is extremely useful (depending on how lenient the DM's interpretation of its precision is). I just find it more atmospheric when PCs are venturing into dark places with naught but a feebly flickering flame to guide them. In order to make humans attractive, all that remains is to give them a few perks in the same order of magnitude as the demi-human racial abilities (things like the dwarven stonework abilities, extra languages, saving throw bonuses, etc). Here's what I thought of, though of course many other things would be possible. +1 to any two attributes (player's choice). No attribute limits (min 3 / max 18 for all scores). +4 to one saving throw (player's choice). I reckon that should roughly equalise the field.